Sunshine Plumbing and Gas knows that even with devout care, your garbage disposal — an important part of the plumbing system in your home or business — needs professional maintenance to maintain optimal function and longevity. While most garbage disposals are fixed the same way regardless of their model and size, our plumbers have seen how different types and models disposals can make some garbage disposals more prone to issues than others. Our plumbing repair company provides all-encompassing plumbing services, including garbage disposal maintenance, to home and business owners in North Central Florida. 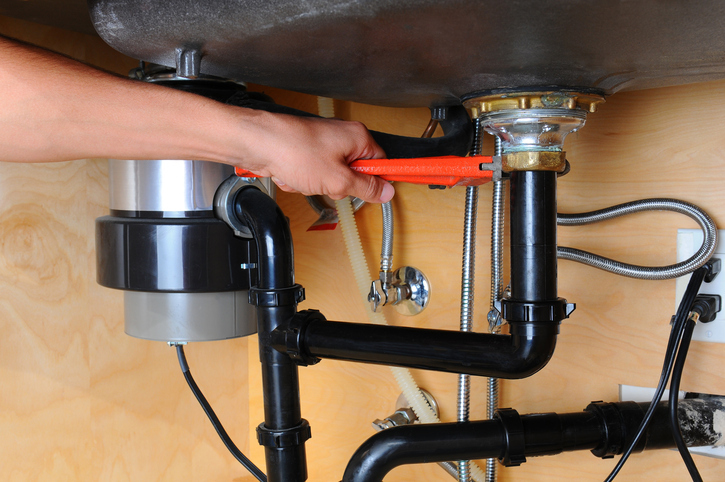 If your garbage disposal needs maintenance services or a repair, contact us. We will troubleshoot any issue you have and make necessary repairs while keeping you informed from start to finish. What Are Common Garbage Disposal Issues? Whether your garbage disposal develops an issue overnight or has a series of problems over a long period of time, call Sunshine Plumbing and Gas for residential plumbing services and commercial plumbing repairs. When our plumbers arrive, they troubleshoot the issue and provide fast and effective repairs to get the disposal running again with minimal downtime. A leak from the garbage disposal is always a good reason to call to Sunshine Plumbing and Gas. It can signal a failing part of the disposal itself or a different plumbing issue in the connecting pipes. When food particles or dreaded fat, grease, and oils make their way through the disposal and into the drain pipe, they can accumulate and clog over time. Don’t try to dislodge a difficult clog yourself — call Sunshine Plumbing and Gas for professional services. Unusual noises are rarely a good sign. For your garbage disposal, they may mean a handful of things. First, the impellers could be jammed, and the noise is the motor turning as the impellers struggle to move. Or, it could be an internal issue in the motor or grinding chamber. Check whether a circuit has been tripped or the power disconnected. In either of these cases, call us to have our plumbers troubleshoot the entire garbage disposal and make any necessary repairs to the unit. If you can hear the motor humming or the disposal trying to run, the impellers, or blades, are likely jammed. Never reach into a garbage disposal and try to unjam the impellers with your fingers. Use tongs or a wooden utensil to remove the item if you can see it. What Are The Two Types Of Garbage Disposal Feed? Once you have a garbage disposal, it’s hard to imagine life without one. These handy features readily grind up leftovers so they don’t have to linger in the trash an extra day and create unpleasant odors. Garbage disposals have one of two types of feed: continuous or batch. Most homes have a continuous-feed garbage disposal. It begins running as soon as you turn it on and stops when turned off. Because of this continuous nature, you can put garbage disposal-friendly foods into it while cooking or cleaning up the kitchen, without waiting for the grinding chamber to fill. A batch-feed garbage disposal has a cover or stopper over the grinding chamber, and the chamber must be full before it can be powered on and used. The cover and chamber restriction can be viewed as a safety measure because they prevent foreign objects from falling into and jamming the chamber. What Kind Of Garbage Disposal Should My Home Have? The answer depends on your lifestyle and how the garbage disposal will be used. The price of a disposal usually corresponds to its horsepower and size. Sunshine Plumbing and Gas will help you decide what kind and size of garbage disposal best fits in your home. Half-horsepower garbage disposals are an affordable choice that provides longevity as long as you don’t overfeed the disposal or use it all the time. These workhorses can hold more food than the others and are often made of stainless steel grinding components, making them quite reliable. It’s possible to start putting not-recommended items into these garbage disposals and get away with it, but we advise against it. Keep in mind that you’ll need the biggest amount of space for the installation of the biggest type of garbage disposal. This is the lowest horsepower available and should only be installed for very short-term uses. This type of garbage disposal is prone to easily jamming and quickly rusting out. Most kitchens are well served by a 3/4 horsepower garbage disposal that keeps up with everyday demands. Garbage disposals at this level are also quieter than those with less horsepower, but begin to increase in size and space needed for installation. Should I Use Hot Or Cold Water When Running The Garbage Disposal? Cool or cold water is better. With it, any residual fat, oil or grease in foods going down the disposal will remain solid. Use a steady stream of cool water for about 30 seconds before turning on the disposal, while it’s running, and for a few seconds after it stops running to flush out any food particles. How Do I Remove Something From Garbage Disposal? Whether you’ve accidentally dropped a spoon in the garbage disposal or something appears to be jamming the blades, do not use your fingers even if the unit is powered off. Instead, either turn off or unplug the garbage disposal and use a flashlight to look inside. If you see the object, use a pair of tongs, magnet, wooden utensil or another object to pull it out. Use a hex or Allen wrench to loosen the jammed blades and remove the object. Why Does Water Back Up Into The Garbage Disposal? When a pipe is clogged, the water attempting to flow through goes wherever it can to continue its journey. In this case, it’s the drain pipe connected to your garbage disposal. If you’re unable to clear the drain yourself or you’re more comfortable letting the professionals handle it, call us. Can I Use A Drain Cleaner In My Garbage Disposal? Yes, but be very careful. Garbage disposals often have internal parts made of plastic that can be damaged by caustic drain cleaners. Most major drain cleaner brands carry products that are safe for garbage disposals. But when in doubt, call Sunshine Plumbing and Gas before you pour a chemical cleaner in your garbage disposal. I Have A Septic Tank; Can I Still Have A Garbage Disposal? Yes, but extra care will be needed when using your garbage disposal. Since the septic system relies on bacteria in the tank to break down matter passing through, you’ll need to be cognizant of what you put into the garbage disposal and how it could help or hinder the bacteria in the tank. Using the garbage disposal too often may lead to the food piling in the tank and not breaking down, leading to a clogged septic tank and major plumbing issues. How Can I Clean My Garbage Disposal? With the sheer amount of liquids and solids put down the garbage disposal, the garbage disposal will likely need cleaning from time-to-time. To clean the disposal, pour a little dish soap into the system, then turn on the unit and run the cold water for a few seconds. What Items Can Go Down The Garbage Disposal? Contrary to popular belief, the garbage disposal is only designed to handle a limited number of food items. To increase the longevity of your unit, limit the items you put in the garbage disposal to liquids and soft, chopped foods only.